They say that “mistakes are proof that you are trying” … and boy do teachers sure try. We succeed in many, many instances, but there are times when we make mistakes. Yep, I said it. Teachers make mistakes. While we do make general mistakes, like writing a word incorrectly on the whiteboard or that time 1+1 didn’t equal 2, there are 5 mistakes that we need to be more mindful of… and all 5 mistakes have to do with how we treat ourselves. Teaching takes up a good majority of our personal and professional lives. We are overworked and underappreciated, especially when we think about ourselves. We are always putting others first. “Joe wasn’t feeling well today, I should send his parents an email” … at 9PM. Not only that, but we have a really hard time shutting off the teacher part of our brain. And that’s what happens when you truly love what you do. You invest all of your time and energy, and you divulge your heart into your students and your classroom. But what about YOU? 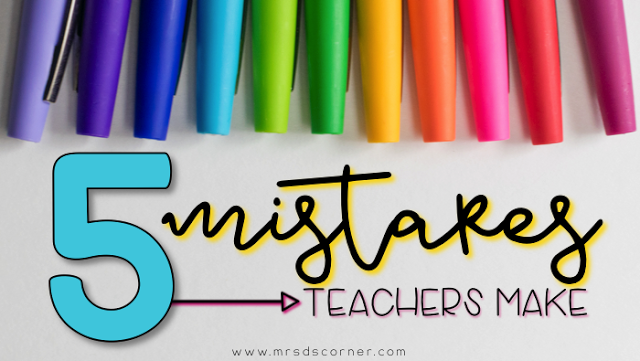 Here are 5 common mistakes you are making as a teacher, and a tip for each to help you better manage your school and personal life. Sleep is number one, or it should be. Not only does it help you feel well rested each day and keep you from becoming an uber-crankhead, it’s healthy for you (ie. if affects your quality of life).Not only does sleeping benefit your mind and body, but it helps with those pesky dark undereye circles and in some cases, they say it can affect your weight. Hey, you can’t eat if you’re sleeping. I’m not necessarily saying you should come home and go to sleep. Although a 30 minute nap is great, you might just need a minute to unplug from everything. So leave your phone in the kitchen, go plop on the couch and listen to the silence (that means no TV!). Enjoy it and refresh your mind. Oh yeah, and stop pulling those all-nighters. 2. Not asking for help when it’s needed. We like to fix and do things ourselves… we are teachers after all and we like to know how to do everything, even when that means we are taking on more than we can actually do. But I am here to tell you that it is absolutely okay to ask for help when you need it. Have a behavior problem in your classroom? Ask admin for help. That’s what they are there for. Not sure how to teach fractions? Ask another grade level teacher for tips and tricks. Make your life easier by asking for help. It’s also okay to just not do something. For example, bulletin boards… I despise them. So at the beginning of the year, I put up a generic bulletin board and call it a day. Well, actually a year… because then I don’t touch it until the last day of school when I’m taking it down. Not only am I saving myself time, but I’m not even letting the stress of that invade my life. 3. Spending too much on supplies. Put the 42 boxes of crayons down and step away from the Target Dollar Spot. 4. Stressing over not having the Pinterest perfect classroom. Let me let you in on a little secret… the best classrooms aren’t Pinterest perfect. They’re messy. They’re loud. There are kids walking around the classroom. It’s called learning. And that’s what we want – we want our students to learn. I for one, would rather be remembered by my students for teaching them that cool math song to help them remember QDPAC … over the teacher with the really cool curtains that matched the rug, and the slightly OCD organized bookshelf. …because who wants to be perfect anyway? 5. Not believing in yourself. Let me start by honestly telling you that I have said every. single. one. of those things before. Multiple times in a school year too. You are NOT alone, and you are NOT a horrible person for thinking and feeling like that. You’re human and you can only do so much. So what helps when you reach that breaking point? Sleep. Disconnecting from everything. Spending quality time with your family. And taking care of YOU. Do something that is just for you and no one else. Eventually those feelings will fade, especially after a really good night of sleep (or two or three…). But believe in yourself. Know that no one else can be you, and that’s what makes you unique. I know you’ve read the quote “You were given this life because you are strong enough to live it.” So start there. What tips do you have for helping teachers take better care of themselves? Your post came in the nick of time! I will be starting my 19th year of teaching on August 29th, and I still catch myself making ALL of those mistakes. Teaching blogs are great, and so is Pinterest. But… My classroom will not look like some of the ones I see. Thanks for the reminders about what really matters!